Bangalore, the English version of Bengaluru, is one of the most delightful cities in India, located in the southern state of Karnataka and quite different from the cities of the north. Aptly termed as "India's city of the future" by Jawaharlal Nehru, India's first Prime Minister, Bangalore has also earned the sobriquet of the "Garden City of India" thanks to several gardens and boulevards found in the city. A holiday in Bangalore provides all that a traveller can ask for. The sights and sounds of Bangalore are at their exuberance best not only at fiesta time. If you want to make every day a fiesta, travel to Bangalore. India's great southern city of Bangalore is rightly called the Silicon Valley of India. The city contains some beautiful parks, ruched velvet night-spots, delectable shops and arguably the best nightlife in India, all the ingredients for a wonderful holiday in Bangalore. With its nice climate, the cosmopolitan Bangalore is a tourist’s destination for all seasons. Bangalore has also an impressive collection of architectural sights, including its Vidhana Soudha, Karnataka's State Legislature and Secretariat building, regarded as the finest example of "neo-Dravidian" architecture. The Bangalore Fort, built by the city's original architect, Kempe Gowda, is another attraction in Bangalore. Nearby the 16th century Ganapathi Temple is Tipu Sultan's Summer Palace, constructed toward the end of the 18th century entirely from wood. The Bangalore Fort, built by the city's original architect, Kempe Gowda, is one of the main attractions in Bangalore. 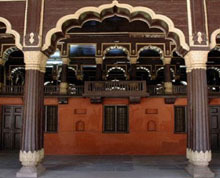 Abounding with history, the fort was renovated by Mysore ruler Haider Ali and his equally illustrious son Tipu Sultan. Within the enclosures of the fort is located the beautiful Tipu Sultan's Palace, characterized by its wooden pillars and ornamental frescoes. Visitors who travel to Bangalore set off for Bugle Hill, where is located the 16th-century Bull Temple in the Dravidian style built by Kempe Gowda, the city's original architect. The temple houses the magnificent black-granite statue of of Nandi (Shiva's sacred bull), carved out of a single block of granite. A popular 250 acre garden in the heart of Bengaluru, Cubbon Park is a favourite retreat from the hustle and bustle of the city for the people of Bangalore who throng here in large numbers. One of the most visited parks in Bangalore, Cubbon Park has more than 7000 plants of 400 species. The extensive Lalbagh Botanical Gardens should be your stopover if you are on a sightseeing trip to Bangalore. Occupying an area of 240 acres, the gardens were laid out by Hyder Ali in 1760 and develoed by his son. The Lalbagh Botanical Gardens is the habitat of more than a thousand different species of trees and plants. Don’t miss the flower show which has been organized since in 1912. 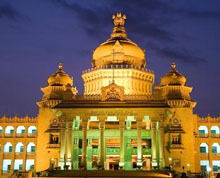 Built in 1954, the huge Vidhana Soudha is a prominent landmark of Bangalore. The buiding serves as seat of the legislative assembly of the state government. A must-see attraction for travellers to Bangalore, the Bangalore palace at the heart of the city still retains its glorious past. The Palace was opened for the public viewing in 2005 after elaborate renovations. The palace has 35 rooms. Located on a hillock, this magnificent temple was built in the neo-classical style in the late 1990s. 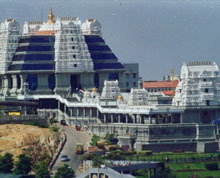 It is a popular culture centre for the followers of the International Society for Krishna Consciousness (ISKCON). Dedicated to Hanuman, the monkey god, friend and helper of Lord Rama, the Anjaneya temple also houses the shrines of the Rama, his consort Sita and his loyal brother Lakshmana. Attracting visitors in large renumber, the Jawaharlal Nehru Planetarium in Bangalore offers regular shows on astronomy related subjects. The Planetarium has a seating capacity of 210. Built in 1864 in the Gothic Style of architecture, Attara Kacheri is located opposite the Vidhana Soudha and houses the High Court of Karnataka. Situated on Palace Road, the National Gallery of Modern Art showcases the paintings of renowned painters like Raja Ravi Verma, Rabindranath Tagore, Jamini Roy, Amrita Sher-gil and M.F. Hussain. 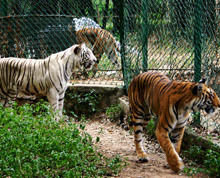 Situated about 22 Kms south of Bengaluru city, Bannerghatta Biological Park is a part of the Bannerghatta National Park. Known for its tiger and lion population, Bannerghatta Biological Park is a wonderful place to view wilidfe in their natural habitat. Within the confines of the part you can also find a Zoo, Butterfly Park and Rescue Center. Located 372 km from Bangalore, Jog Falls is the highest waterfall in India. At 830 feet, the falls is simply a majestic beauty. Innovative Film City, The Art of Living International Ashram, Kanva Reservoir, Muthyala Maduvu or Pearl Valley, Ghati Subramanya, Nandi Hills, Shivaganga, Hessaraghatta, Devarayanadurga Kaivara, Viduraswatha, Kolar Gold Fields and Mekedatu are some of the places that can be managed as a day-trip from Bangalore. If you are a city-lover keen on shopping, Bangalore is the place to be. M.G. Road, Commercial Street and Brigade Road are the places in the city where you can find every conceivable kind of stuffs for shopping. Central Cottage Industries Emporium, Cauvery Arts and Crafts Emporium and Karnataka State Silk Industries Emporium are some famous shopping destinations located on the M.G. Road. Bengaluru, the capital of the south Indian state of Karnataka, is accessible through rail, road and air. How to reach Bengaluru by Air : the airport at Bangalore is connected to major cities of India and the world such as London, San Francisco, Brussels and Toronto. That airport is 40 km from the city centre. How to reach Bengaluru by Rail : Bengaluru is well connected by rail to almost all the major cities in India. Bengaluru City, Bengaluru Cantonment, YESVANTPUR and Krishnarajapurm are the main railway stations in Bangalore. How to reach Bengaluru by Road : Bengaluru is well connected to the major cities and places in south India.